As most people must have heard by now, Harper Lee died last week (Feb 19, 2016). I won’t go into her biography – after all, plenty of people have done that already. Instead, I will present some statistics on her Amazon book sales over the past year or so, as I happened to have been following those intently over that time span. 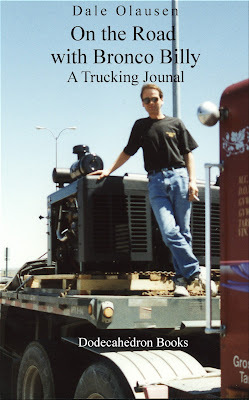 My original motivation was to see how the original announcement and subsequent publishing of “Go Set a Watchman” affected her sales and reviews on Amazon. I had stopped my data gathering a couple of weeks ago, but her death caused me to reconsider. Though it might seem morbid, I was curious how her death affected her sales. 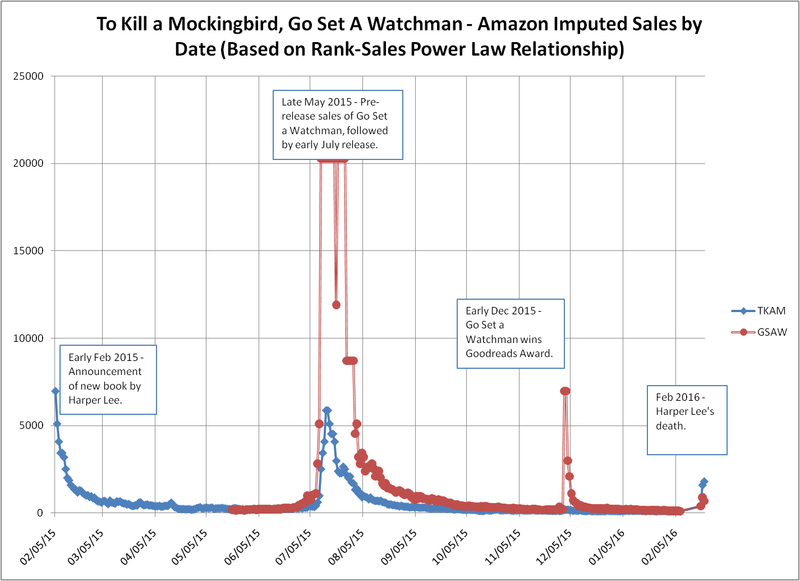 The graph below shows how sales of To Kill a Mockingbird (TKAM) and Go Set a Watchman (GSAW) did over the timespan from early February 2015 to late February 2016, a period of a little over a year. The graph is fairly self-explanatory, but since it may be difficult to read on some screens, I will follow up with a narrative analysis. 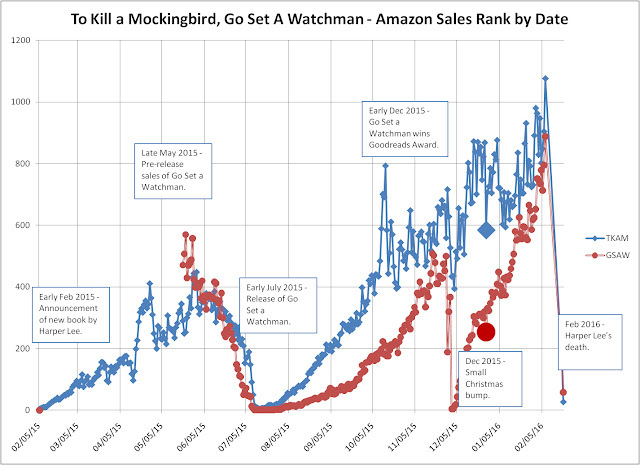 Also, keep in mind, that on this graph, when the lines go down, sales are increasing. That can be a little confusing, rather like following golf scores at the U.S. Open – lower numbers are better. The first key event was the announcement that a new book by Harper Lee was in the works, in early February 2015. That kicked off my data analysis, so I don’t have data preceding that event. As you can see, that announcement led to TKAM being ranked at or near the number 1 spot on Amazon in early February 2015. 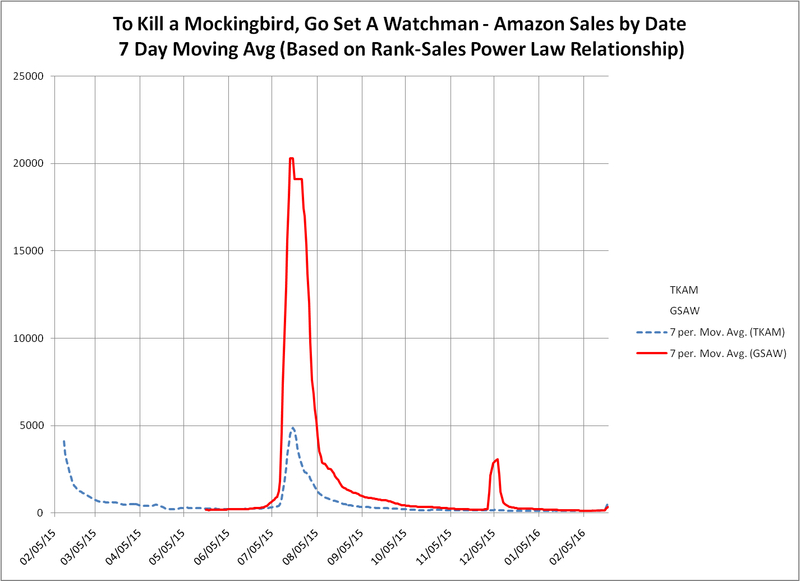 As the later trend indicates, TKAM’s baseline ranking was probably in the 500 to 1000 range, so this announcement had a huge effect on the sales for TKAM. The book stayed in the top 100 for about a month, and within the top 500 right until the summer. The next key event was the pre-release of GSAW in late May 2015, followed by publication in early July 2015. GSAW began at about rank 500 when the pre-release became available (that means people could pre-order on Amazon, and have the book sent to their Kindle or their mailbox as soon as it was out). It then went steadily up in the ranks (down on the graph), hitting number 1 early in July. TKAM pretty much followed the same path, though it didn’t hit number 1 (its best ranking in that period was number 5). Both books then lost those excellent rankings, drifting upwards to about the 400 to 600 range over the next few months, until early December. 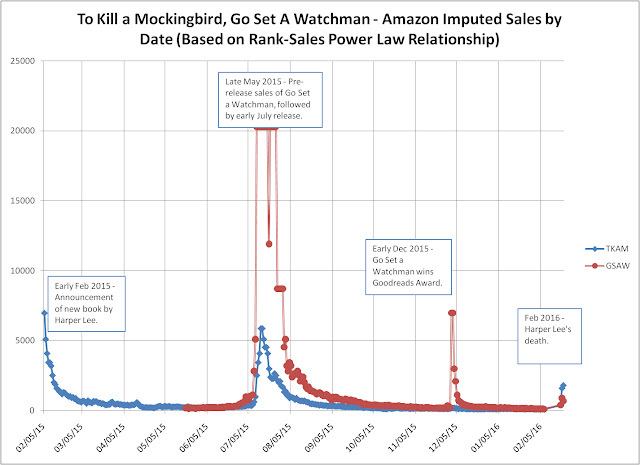 It should be noted, though, that GSAW’s sales ranks were better than TKAM during that time. The next major event happened in early December, when GSAW won its category in the Goodreads Book of the Year (2015) rankings. That had GSAW back at rank number 1 in early December, though it drifted back up into the 500 to 1000 range by early February 2016. TKAM got a bit of a boost at this time from the success of its “sister book”, but the effect was quite small, as the graph indicates. The larger markers on the graph show Christmas. As you can see, TKAM got a bit of a Christmas boost, dropping a couple hundred places in sales rank, from about 800 to about 600. The Christmas sales rank boost for GSAW was very modest, more of a Christmas blip, really. Then, of course, we come to Ms. Lee’s death last week. As I noted in the intro to the blog, I had stopped gathering data in early February 2016, thinking that one year was plenty. Thus, the interruption in the time series in the two weeks before her death. But the important finding is obvious – death can be a good career move, at least for a while. 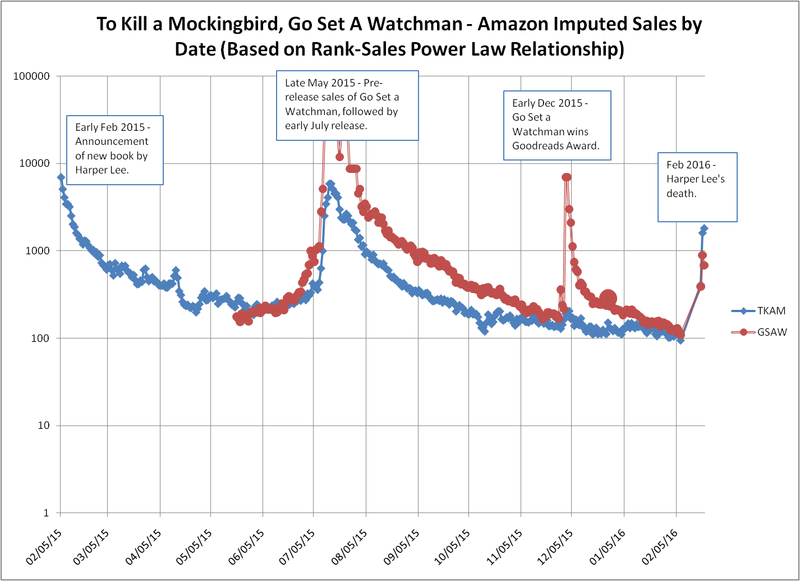 Both books are back to the top 100, with TKAM in the top 25 over the past 3 days (Feb 20 to 22) and GSAW in the 50 to 100 range. Time will tell how long that effect lasts – based on previous key events, one would expect both books to be in the 500 to 1000 rank range within two or three months. The next graph is a bit more speculative. I used Hugh Howie and Data Guy’s sales rank to sales conversion formula. This is a power law mapping, based on crowd sourced author data indicating how their daily sales and sales rank correlate. The exact form of the “real” underlying function is unknown, so I am using Data Guy’s version of this as a “best guess”. I should note that the continuous function estimates somewhat high at the very top ranks, compared to the mapping above. But it is not unusual for there to be uncertainty in real world applications of power laws in the extreme ends of the range. The key events and the responses to them are the same as in the previous graph, though the scale of the effects are very different. That’s because of the power law nature of the relationship between sales rank and sales. The number of sales associated with a low ranking is amplified by the power law, compared to the number of sales associated with a higher ranking. For example, we see that the Goodreads Award boost for GSAW is not nearly as prominent in this graph, as it was in the ranking graph. That’s because the award only resulted in the book going as high as 4th rank, and the boost to better than 100th rank only lasted for about a week. Similarly with the sales boost caused by Ms. Lee’s death. The third graph, below, shows the same data as the previous graph, but uses a logarithmic scale for the y-axis, sales. That allows one to see the small scale effects better, that are obscured by the scale differences in the original graph. It also makes clear that neither books sales ever dropped below 100 copies per day. The final graph is similar to the second graph, but smooths the data with a 7 day moving average filter. In another blog, I will analyse the trend in Amazon reviews over this time period, and make some observations about the interaction of sales rank and numbers of reviews.